Our Macs are where we work, where we socialize, and where we can enjoy ourselves and relax with music and films. So it’s a little disappointing when the audio lets things down, whether that’s fuzzy sound, fluctuating volume levels, or being simply too low for us to fully appreciate it. Whatever the reason, there is always room for improvement to get the best audio quality from your computer. We’ve gathered a few ways to tweak sound quality on your Mac, including both hardware and software enhancements. There’s nothing like a decent speaker (or five) to truly get the best sound from your Mac. Arrange them around the room for a home cinema experience or dot them around the house to get great sound wherever you are. You can spend $100 or thousands depending on your budget, but for decent speakers, it’s worth spending more for that crisp, perfect sound. If you don’t want to be blasting Jay Z across the office while you work or treating your roommates to the glass-shattering screams in the latest horror flick, headphones are a discreet alternative. Go tethered with a wire or cordless with Bluetooth, and the benefit of headphones is that they sit snug either in or over your ears to get truly immersive sound. One of their major advantages is that many now come with noise-cancelling technology, so there are no outside distractions to affect your listening. If buying new hardware isn’t in your budget, revitalizing your software is a more economical way of improving your Mac’s sound. In fact, updating your system forms a solid base for getting the best sound possible before it even reaches your external devices, making your Mac speakers or headphones sound even better. iTunes has some features of its own that can be used to improve iTunes sound quality, such as the Sound Enhancer under Playback Options. There are also additional aspects to better control audio playback. Have you ever noticed that however loud your volume is set, some songs are quieter than others? Your songs may be sourced from multiple formats, such as CD rips, digital re-workings of LPs and cassettes, and live recordings, all of which are likely to vary in their sound quality and volume. Apart from having to manually readjust your volume to how loud you actually want to hear a song, it can be jarring to reassess your sound when it varies track by track. iTunes has a Sound Check option, also under Playback Options, which evaluates the loudness of all the songs in your library and normalizes them to play back at the same volume. Since this doesn’t involve editing the songs, all of the files are unaffected when Sound Check is turned off. 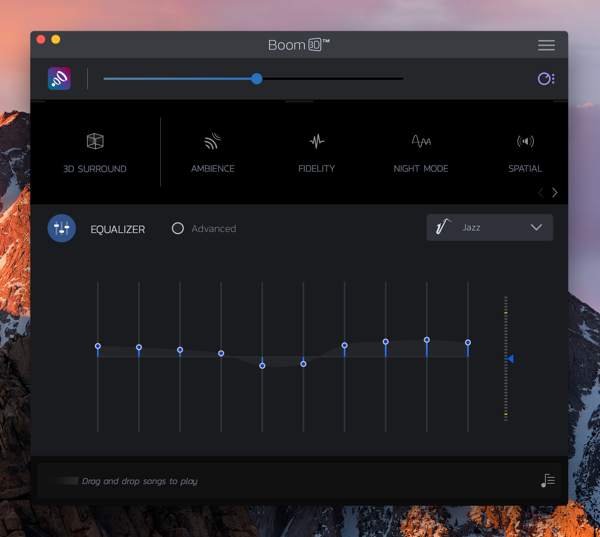 To get consistent sound throughout your system, it’s worth using a Mac equalizer software, such as Boom 3D, to level your audio library. Rather than affecting the individual files, Boom 3D is a system-wide software that not only equalizes your volume but enhances your sound output. It can also boost the volume of individual songs, and instead of editing the original file, it creates an enhanced copy, so you have both versions at your disposal. Take control of the bass and treble to customize your sound, or use standardized presets. With Boom 3D, you can also control the volume of individual apps so that your background notifications don’t override your music, or to ensure the project you’re working on supersedes background audio. iTunes sells audio as AAC files at 256 kbps, which is better than their pre-2007 128 kbps bitrate but is still reduced from its optimum quality. Some songs may have already been downloaded in the old, smaller format, so if you have the space, it would be worth re-downloading the files in the larger bitrate. Since people want the capability to hold thousands of songs, AACs are compressed for smaller file sizes, typically stripping away the subtlest of “irrelevant” background data that we can’t hear, which means that some of the complexities of the audio are lost. If you have the space to handle large file sizes, it can be worth downloading your music in alternative formats, such as FLAC (Free Lossless Audio Codec), which maintains the integrity of the original audio. Mac doesn’t currently support FLAC files, but there are converters, such as Permute or iFlicks, or they can be played on an advanced multimedia player, Elmedia Player. To get the best sound possible from your Mac, it’s best to commit to two approaches in tandem: investing in effective sound gear, whether headphones, speakers, or both, and boosting your Mac’s sound performance with iTunes features and additional apps that promote loud yet clear sound. Equalizing your library’s playback volume as well as boosting the sound input and playing higher quality files all contribute to improving the sound quality on your Mac.